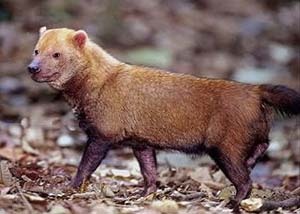 The Bush Dog was first reported by Lund in 1839. They are widespread, inhabiting Bolivia, Brazil, Colombia, Ecuador, French Guiana, Guyana, Panama, Peru, Paraguay, Suriname and Venezuela. They inhabit mostly forested areas and wet savannahs. It is a very distinct looking dog, sometimes thought to have similar features to weasels or otters. They do spend a lot of time in or around water. It is red-brown in colouration with a darker tail. It has a short tail, webbed feet and a rounded skull. They weigh around 5 to 7 kilograms on average, and are between 55 to 75 cms in length. Their tail is a further 12 to 15 cms. They stand an average of 30 cms tall at the shoulder. They are also known by other common names such as the Savannah Dog or the Vinegar Dog. The French know this dog as Zorro. The Bush Dog is known to be semi-aquatic, possessing the ability to swim and even dive underwater. They are often known to live together in small groups, an order of dominance will be established. They have been reported to be highly vocal animals, and use high-pitched peeps to locate other pack members (Nowak 1999). The male Bush Dog will do the majority of the hunting, feeding upon small mammals, rodents and other such sources. The gestation period is 67 days, with anywhere between one to six pups being born. The pups remain with their mother from 8 weeks up to 5 months. They are currently (2003) listed as a vulnerable species. Their decline is not due to hunting, in fact native americans often kept the Bush Dog as a pet. Habitat loss and destruction is the main reason for their decline.